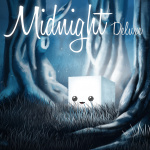 Midnight Deluxe is a swift follow-up to last year's slight Switch eShop platformer, 36 Fragments Of Midnight. While it looks nigh-on identical, however, it's actually a very different game indeed. If 36 Fragments of Midnight was a fairly traditional bite-sized 2D platformer, Midnight Deluxe has more in common with the kind of 2D arcade golf games you might have played on mobile. You're still controlling Midnight, who is essentially a white square with a smiley face. 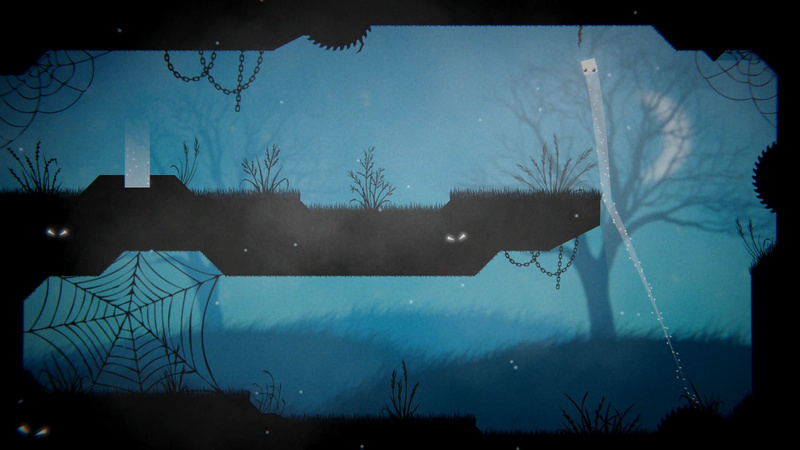 And you're still bouncing around hazard-strewn levels, avoiding buzz saws and spikes. But this time Midnight is less a free-moving platformer character and more a sentient golf ball, launching from a standing start in whichever direction you choose to punt him/her. Movement is handled holding A, dragging out a flight arc with the left Joy-Con thumbstick, and then releasing A. If you're playing in handheld mode you can utilise Switch's touchscreen by literally dragging out a flight path yourself. This feels more instinctive than the physical control method, although it requires you to either put your hand over an important area of the screen or else divorce the angle guide from Midnight altogether, which makes it trickier to judge things. Whichever method you choose, a released Midnight will fly off at the appropriate angle, bouncing off level furniture as physics dictates. Midnight's blocky shape needs to be taken into account here, as you might find yourself springing off surfaces at a slightly odd angle or sliding rather than rolling down a hill. The goal, as with any golf game, is to get the 'ball' in the level-ending hole with as few hits as possible. You can take as many swipes as you like, but you'll only get a star rating (from one to three) if you're efficient. While Midnight Deluxe's controls and premise are simple, we find it doesn't quite have the right degree of tactile precision that such games require. Judging the correct level of power is a little tricky in certain occasions. It comes down to the fact that the process of extending and contracting Midnight's aiming guide feels jittery and imprecise - especially when the difference of a millimetre in any direction can lead to wildly varying results as you careen through the level. The game's level design doesn't help here, rapidly ramping up to provide brutal insta-kill assault courses that will have you restarting again and again. It's good that this can be done quickly with a simple press of X, but when it feels like you're essentially doing the same basic thing repeatedly until you stumble across the necessary weighting and angle, it gets a little tiresome. Quite why the developer would draw attention to these finicky controls by hurrying you along in some of the levels we're not sure. Certain stages will set a large boulder rolling towards the hole, leading to an undignified scramble and more restarts. It all looks quite pretty, though. As with the preceding game, there's an attractive (if hardly original) silhouette style that lends the game a feeling of class. 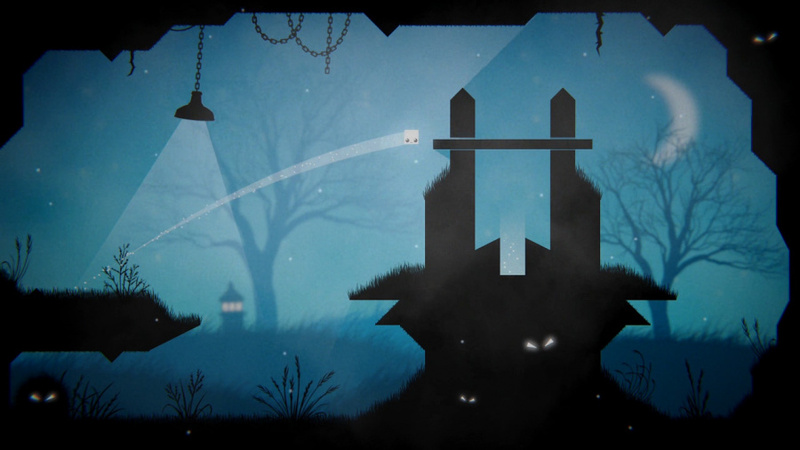 Admittedly, this chimes more with 36 Fragments of Midnight's platformer world than a casual golf game, but there's a certain appeal to the incongruity of it all. Incongruous is probably the word we'd use to describe the game's mournful piano soundtrack, too. It hardly screams 'fantasy sport' at you, though it does lend the game a certain zen-like appeal. All in all, Midnight Deluxe is an interesting repurposing of 36 Fragments of Midnight's assets, and the result is a lot more substantial. We applaud the developer for taking its fledgling series in a completely different direction, though the results lack the necessary kind of tactile joyfulness that such casual sports games really need to thrive. 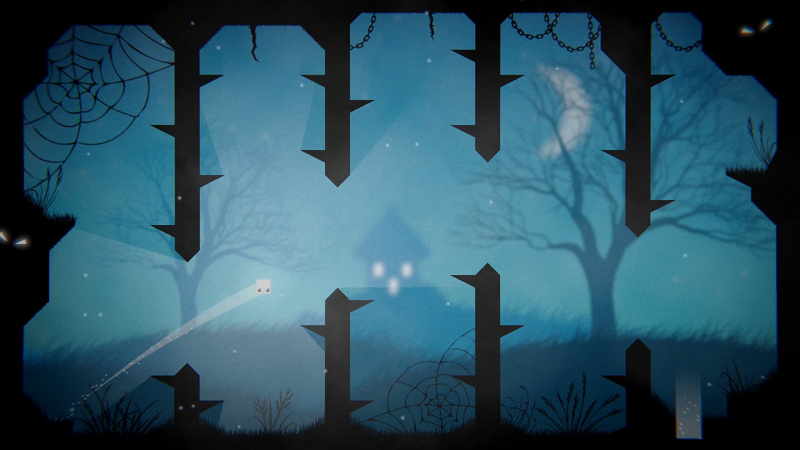 Despite appearances, Midnight Deluxe is a completely different game to 36 Fragments of Midnight before it. While it's a solid enough casual golf game, however, it lacks the precise control, generous level design and joyful spirit of the best examples of the genre. I’m a huge fan of Super Stickman Golf and this game reminded me of it in the videos I’ve seen. I didn’t try it yet but it was so cheap I figured “why not”. I actually like this one, and I liked the first one too lol. Sometimes I wonder if even the people running this site had a Wii U. They released Midnight and Midnight 2 on there long before 36 Fragments, and I came here to see if there is anything new in this game or if it is just the same levels. But this review doesn't even seem to know those first two games exist. It looks nice, and it's cheap. Looks like a good time killer but only if you had nothing else to do. I'm glad it's at least cheap. @retro_player_22 I've been super sick the past few days and this past weekend i was laying in bed A LOT playing Switch. I picked this one up cause I enjoyed the last one and it was a really great chill game to play while I was feeling like crap lol. Relaxing, pretty challenging, but nothing too intense or anything. I dig it.